Today’s “Camino moment” could have been an opportunity for us to learn more about what makes us tick and fix it. At the very least, we could have improved our attitude; instead, all we wanted to do was escape. We definitely were not happy campers! Actually being “happy campers” in the literal sense might have been preferable. More about that later! Last night’s dinner at the albergue in Villar de Mazarife (salad, gazpacho, vegetarian paella, crepes with whipping cream and a strawberry) followed by Pepe’s queimada ritual was one of the highlights of our journey so far. 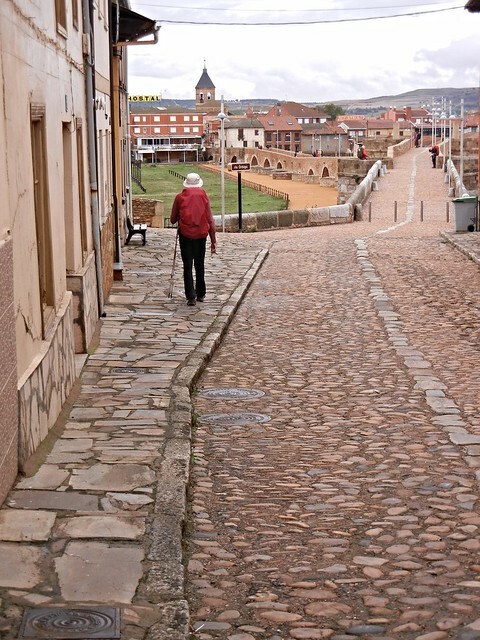 After Tania told us about the queimada ritual she experienced two years ago, we put it at the top of our Camino bucket list. We knew it would be by chance that we would get to experience it; it isn’t something you can plan on, make a reservation for, or order. Now the questions are: Can we bring Orujo Gallego (the primary ingredient) home? What are the prerequisites for learning the incantations to keep the evil spirits at bay? Do we have to be Spanish or will a Spanish name do? Quite often breakfasts are sparse, but the one this morning was complete with muesli, toast, churros, muffins, yogurt, orange juice, and cafe con leche. Unfortunately we don’t know enough Spanish to convey to Pepe just how much we enjoyed our stay at his albergue and the queimada ritual in particular, so we expressed our appreciation non-verbally with hugs, kisses, and hand-shakes when we left this morning. Our next destination was only 14.6 km away. The first section of our walk was relatively solitary and on an asphalt road that was straight, flat, quiet, and not terribly interesting. After 9.6 km we stopped at a cafe in the little village of Villavante for a couple of bananas, cafe con leche, and ice cream. Other peregrinos came pouring in soon after we arrived. Where did they all come from? It’s a mystery, because the road we were on was straight as an arrow with no one visible ahead or behind us. 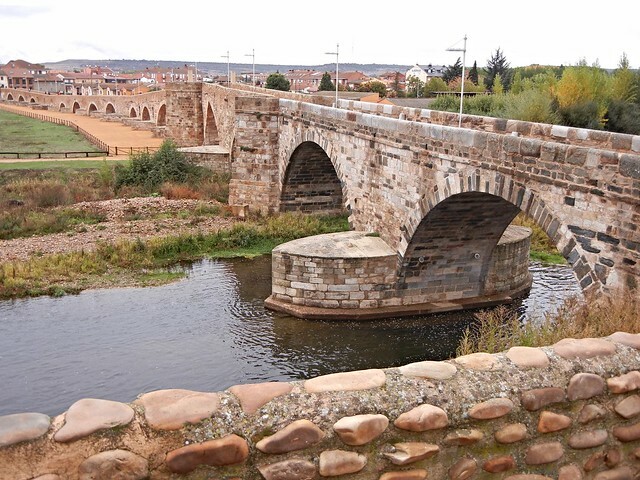 The bridge has facilitated trade since Roman times including the passage of livestock as part of the cattle trail “camino de la canada” (canada?) not to mention sweaty pilgrims like us! After passing over the bridge, we came to Hospital de Orbigo and a Knights Commandery of the ancient Order of St. John who maintained a pilgrim hospital here. 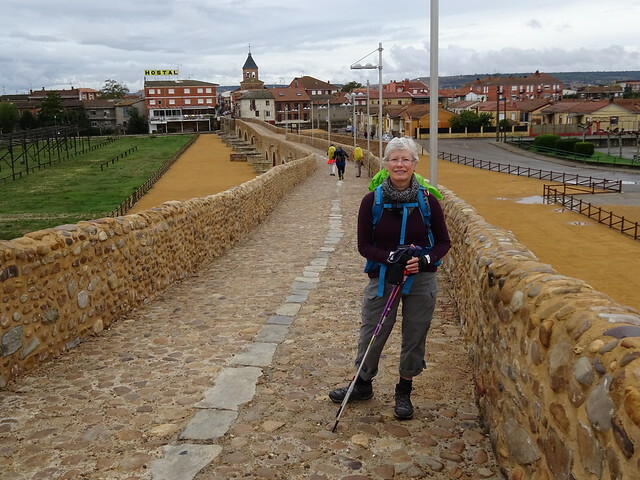 Now back to our “Camino Moment!” We checked into an albergue and quickly checked out again after we found another place to stay. 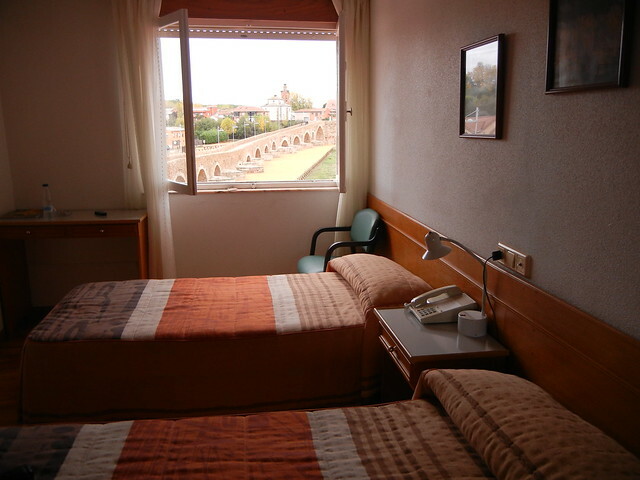 We were happy to pay double elsewhere, just to have a window – a window overlooking the famous bridge, no less! Peregrinos in days of old would take whatever shelter they got with gratitude. We are modern peregrinos who don’t want to stay in a stuffy place without WiFi or a window. There would have been nothing for us to do but to go to bed and wait for the next day. Rather than do that, we moved. 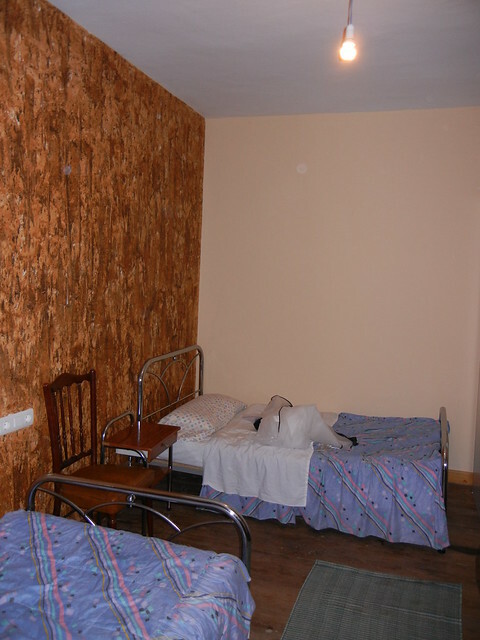 Here are pictures of the albergue we left and the hotel we moved to. Later on in the evening we spent the better part of two hours eating dinner and enjoying the company of Garry from Australia and Rebecca from Washington State, U.S.A. The vino tinto and conversation was flowing in equal proportions! A room with a view! And Wifi! It’s definitely not too much to ask for! ps All of Sidney in love with your blog. What a fantastic journey you are having. I don”t know how I fell behind in reading your wonderful blogs but have now just caught up. Thank you for sharing all the ups and downs – which, because of your positive spirit, seem few. I don’t expect to ever do this or anything like it, so am loving sharing your experiences vicariously. I’m happy to share our experiences with everyone at home – much better than those old-fashioned post cards!